Boys Soccer put on a heroic performance in the playoffs on Thursday night in a true road game at Marble Falls. Lanier was looking for revenge as their 2017 season ended in an overtime loss to the same opponent. This time the Vikings grabbed an early lead when Shelove Dorsainvil turned home a Rodrigo Suarez cross in the 2nd phase of a corner kick. Lanier took up a defensive posture and set up to hold their goal advantage with Mario Gomez and Martin Ugarte anchoring the midfield area in front of the defensive line. Chris Torres, Michael Varela, Erick Sarmiento, Agustin Ugarte, and Ivan Lopez were all called upon to make tackles and lay their bodies on the line to frustrate the Marble Falls attack. The boys made it to half-time with a a 1-0 lead having conceded sterile possession to the opposition. Marble Falls continued to pour forward in the 2nd half looking for an equalizer, and this created chances for Lanier's attacking players to express themselves as Melvin Andrade, Brayan Garcia, and Luis Lopez all found more time on the ball. Before Lanier could grab a crucial 2nd goal though, it was Marble Falls who found the back of the net on a corner kick as Jorge Nava had no chance to stop an open header from 3 yards. Lanier battled back and held on for their lives at times to keep the match tied at 1-1. The best chance of the remaining time was created by Shelove dribbling past three defenders on the right flank before squaring to Luis whose shot from the penalty spot blazed inches over the crossbar. The match was ultimately decided on penalties, and the three scored by Luis, Melvin, and Martin (coupled with an incredible diving save by Jorge) were unfortunately 2nd best. Special thanks go out to the members of staff who provided extraordinary support for the team. Coaches Idais and Zarate coached the boys up after safely navigating the windy roads to Marble Falls, and it is believed that Coach Idais may be tempted to forgo a position in administration by a more lucrative Formula One contract after his performance. Trainer Blair showed remarkable stamina as he was kept busy tending to numerous player injuries. One such visit to the turf saw him prepare to make a play on the field himself as play bizarrely resumed with him still ushering an injured Viking off the field. The support from the traveling fans - Vikettes, Cheer, and Lanier students, staff, alumni, and groupies was phenomenal. Many thanks to Mrs. Blair and Coach Aguilera for organizing their groups and riding the Spirit Bus in support of the cause. Your voices were heard throughout and no high school soccer team will enjoy more enthusiastic support than Lanier in this year's playoffs. 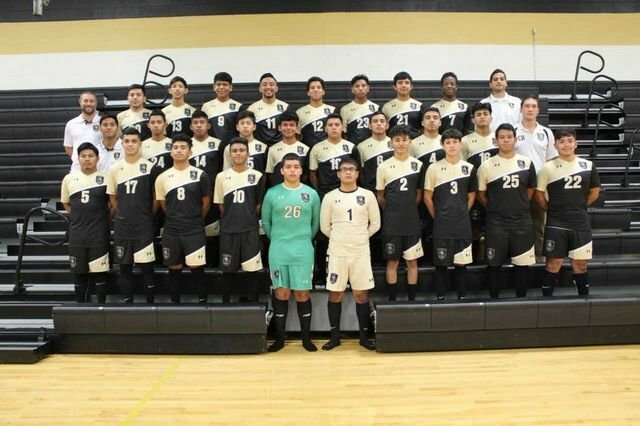 The Class of 2018 will graduate as one of the most successful in Boys Soccer history. Their achievement of reaching the Playoffs in back to back seasons has set a new standard for the program, and they are the first Lanier team in memory to be undefeated through the non-district portion of the season as they won or tied the first 12 matches of the year. Their 53 goals scored in 21 games is a record high during my tenure as Head Coach. As a coaching staff we are most proud though of their achievements in the classroom and the real world. Most of our boys held part-time jobs during the season, an astonishing fact to consider in the context of competing for three full months against teams that hold more full-practices with players who have more time to rest and recover between matches. While juggling all of these commitments, they excelled academically. Four of our seniors were named Academic All-State for being in the top 10% of their graduating class and three were recently awarded the prestigious Moody Scholarship. Eleven of our 14 seniors plan to attend college in the Fall - another boys soccer record. I am proud of their high school careers, and I believe their strong character and ability to overcome adversity will carry them to success in every future endeavor they choose. Boys Soccer recorded a lopsided 5-0 victory over Crockett on Senior Night at House Park. Seniors Agustin and Martin Ugarte grabbed a goal each in the first half. Luis Lopez made it three, before the Class of 2018's Brayan Garcia and Shelove Dorsainvil finished the game off with goals 4 and 5. Lanier started the match with ten seniors as Erick Sarmiento, Ivan Lopez, Alejandro Amador, and Agustin created a solid back line with the lone Junior in the team Michael Varela. In central midfield Martin and Andres Zuniga controlled the tempo and provided service for Shelove, Brayan, and the irrepressible Melvin Andrade up front. Jorge Nava played a flawless game at keeper and will be proud to have kept a clean sheet on Senior Night. Important contributions came off the bench from Seniors David Valdez and Brayan Reyes who provided width in attack, and from Manny Reyes who locked down the central midfield areas with his calm, simple possession. The team also benefited from the enthusiastic support of Senior Mario Gomez, who was disappointed to be ruled out from playing by injury, but made the most of his opportunity to moonlight as an assistant coach from the bench. Many thanks go out to all of the Lanier teachers and staff for their support of our student-athletes Friday night and the entire school year. Thank you for pushing them to become the greatest versions of themselves. The Boys Soccer Program is also especially grateful to Mr. Shanahan for his superb work as Master of Ceremonies and to Mr. and Mrs. Beaman for their classy participation in the Senior Night Presentation with two of our finest young men. 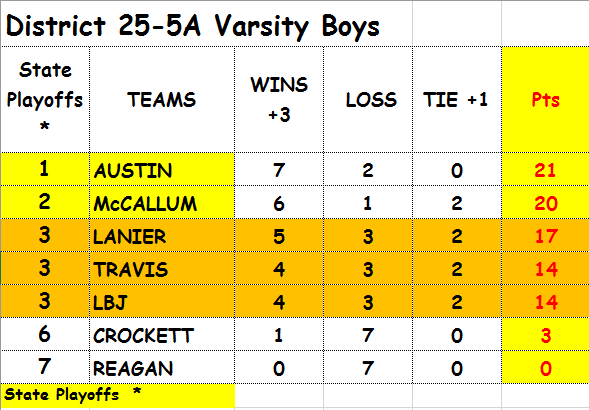 Boys Soccer picked up a crucial win last night against Travis to move into 3rd place in District. Lanier dominated possession in the first half with Erick Sarmiento, Michael Varela, and Chris Torres orchestrating the attack from the back and Agustin Ugarte and Rodrigo Suarez providing the width. One moment of disorganization though allowed Travis in, and Lanier somehow found themselves down a goal at half time. Just 3 minutes into the 2nd half a quick Travis free kick caught the Vikings off guard and Lanier were down 2-0 and facing the possibility of sliding out of playoff position for the first time. The response from the Vikings was swift and purposeful. Andres Zuniga released Luis Lopez behind the back line with a perfectly played through ball to allow a tidy finish just four minutes after conceding. From there the Vikings ran riot, and a cutting edge was applied to the slick possession of the first half. Martin Ugarte found a perfectly timed Melvin Andrade run with a delicious, defense splitting pass to set up the equalizing goal with 25 minutes remaining and allow plenty of time to find a winner. Lanier continued to control the game through midfield with John Palma and Agustin Ugarte combining on the right hand flank to create goal scoring chances. The winner finally came with ten minutes remaining as Martin picked up possession from a quick throw in, played quickly to Shelove Dorsainvil, who turned, dribbled past two defenders and finished across the keeper before a 3rd defender could block his path to goal. Current district standings and highlights from last night are below. Boys Soccer pulled out a dramatic 2-1 win over Crockett last night. The points were in jeopardy until a thunderous Luis Lopez strike from 25 yards was blasted in under the crossbar to settle the match. The winning strike was hit with such velocity that two or three goalkeepers could not have possibly made a save, and the technique required to produce such an effort on his "weaker" left foot made the goal even more impressive. The team moved to 3W-0L-2D in district and extended their unbeaten overall record to 12 games (7-0-5). There will be little time for celebration though, as Austin High remains in first place with 12 points, and a crucial match to close out the first round of district against McCallum looms on Saturday morning. Coach Zarate's JVB picked up another big district win by a 3-1 scoreline. Jesus Nunez scored his first hat-trick for Lanier. Both Varsity goals from last night are available using the link below. Goal #2 is worth a look. Boys Soccer picked up a crucial 2-0 win over Austin High to move into sole possession of 1st place. This was seen as the biggest fixture of the young district season so far, matching up two playoff teams from 2017 who entered the match in the top two places of the standings. Lanier started brightly as energetic team pressing created a chance for Luis Lopez to play John Palma clean through on goal, and Palma’s calm finish found side netting to give Lanier a 1-0 early lead. Midway through the opening half Edgar Mejia earned a foul in a dangerous area and took responsibility for placing the resulting free kick in the back of the net to double Lanier’s advantage to 2-0. The 2nd half was very competitive and physical, but neither side could break through. Mario Gomez created the best scoring opportunity for Lanier in transition, but his curled effort was just inches wide. The defenders entrusted with the duty of protecting Jorge Nava’s goal were immense as Michael Varela, Chris Torres, and Ivan Lopez were impressive in organizing and eliminating threats, and the few times Jorge was called into action, he produced the saves needed to keep his 2nd clean sheet of the season. The defensive effort of Agustin Ugarte though, whose tireless, disciplined marking limited the supply to Austin’s prolific center forward, provided the foundation for the victory and earned Guti credit as Man of the Match. 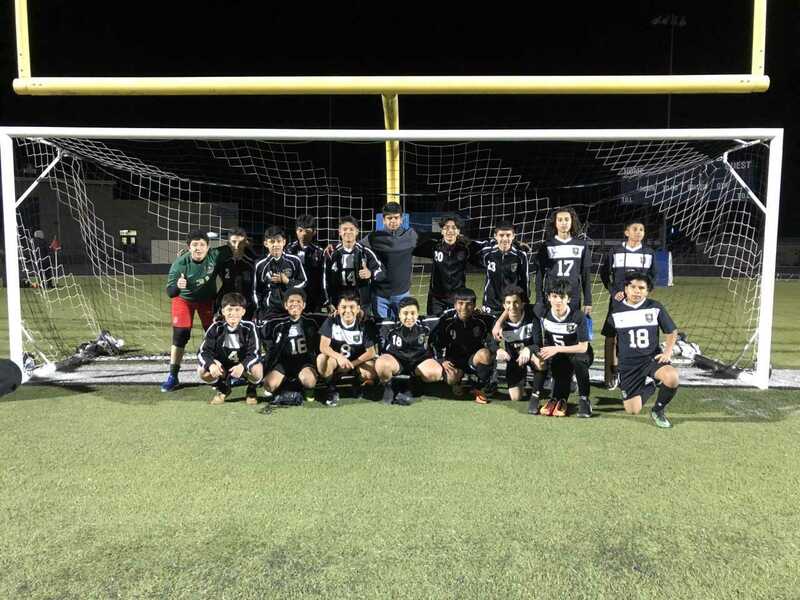 Lanier JVB guys had an outstanding performance this past Friday beating LBJ 2-1. Kevin Arce found the back of the net early in the game from a team effort play and a cross from Ricky Hernandez. LBJ managed to beat our defenders after they were shutting off every play to tie the game 1-1 before half time. The Lanier Vikings were able to outperform LBJ during the second half. Kevin Arce managed to score another goal from a corner kick and a cross from Ricky Hernandez. This time the whole team was able to shut down the LBJ Jaguars to keep the score 2-1. Erick Garcia was the Man of the Match by making two great 1-1 saves. After a rough start the JVB team is playing well together. They are ready and excited to face Austin High this coming Tuesday. Lanier Boys Soccer produced an emphatic 5-0 victory over Reagan in the district opener for both teams. The Blue Raiders spent most of the first half bunkered in their own half with 10 defenders behind the ball, and Lanier dominated the ball enjoying 68% possession. Early chances fell to Luis Lopez and Mario Gomez before Melvin Andrade finally broke the deadlock with just 3 minutes remaining in the opening half. Melvin found space behind the back line, running onto an inch perfect ball from Martin Ugarte before coolly finishing around the stranded goalkeeper. Eight minutes into the second half it was Melvin who scored again, this time lacing an unstoppable drive from outside the box into the top corner. Luis Lopez was credited for an assist for setting up the shot with an unselfish lay-off after winning back possession high up the pitch. Ten minutes later, 2nd half substitute Edgar Mejia took over possession from Melvin before cutting inside and scoring from 25 yards as his side footed effort crept inside the far post. Edgar doubled his tally just four minutes later as he ran on the end of another ball from Melvin before beating two defenders and finishing to the keepers left this time. In the closing stages, John Palma opened his goal scoring account for Lanier as he found his way onto a blocked Brayan Garcia shot and smashed a drive into the bottom corner from just outside the box. Super seniors Manny Reyes, Rodrigo Alarcon, Alejandro Amador, and Brayan Reyes then made their presence known to shore up the defense and preserve Jorge Nava's first clean sheet of the season. Lanier moves to 5W-3D-0L on the season overall and 1-0-0 in district. Lanier had to settle for a 1-1 against Stony Point on Friday night. The Vikings took a lead into half time thanks to a venomous low drive from Brian Garcia after a neat set up by Luis Lopez. The analytics team at Hudl would show that the Vikings were on top for most of the match producing 20 shots and maintaining 57% possession with Mario Gomez, Melvin Andrade, and Shelove all spurning chances to double Lanier’s slender advantage. But the away side were forced to settle for shared spoils as a late throw in found its way to a Tiger foot and an impressive volley was smashed into the top corner from 20 yards. Boys Soccer had a huge weekend winning all three of their matches at the UT Club Soccer Tournament. The team showed class and heart in pulling off wins over strong programs from Wiess, Sulphur Springs, and Cedar Creek by a combined score of 12-4. This group has maturely dealt with adversity and injuries to important members of our team, and they just keep playing the game, never believing that they are out of it. They have great chemistry. They are unselfish. They root for each other, and they don’t care who gets credit for scoring the goals. In the match Saturday, Lanier took on a Cedar Creek team, led by one of the best high school players in Central Texas, that has never lost to Lanier and not been beaten by more than two goals in the past four years. Lanier went behind in the first minute of the 2nd half before showing great poise, sticking to the plan and running off four goals without reply to earn a huge 4-1 win for our program. The team now has a record of 4-0-2 and will look to continue the unbeaten start against Eastside on Tuesday night at Nelson Field. Goals: Edgar, Luis, Martin, Shelove. Friday JVA – 5-1 Win over Liberty Hill. Lanier earned a hard-fought draw against 2015 State Semifinalist Georgetown Eastview today. Shelove Dorsainvil scored his fourth of the season and Edgar Mejia provided another assist to give Lanier the lead early in the 2nd half. Jorge Nava was outstanding at Goalkeeper but could not keep out a screamer from 30 yards as Eastview grabbed an equalizer with 20 minutes left. Great team performance – next game is 4 pm tomorrow at Georgetown HS. Boys Soccer opened the season against Burnet High School in the Georgetown Governor’s Cup. Lanier ran riot in the first half, with Luis Lopez scoring the first goal of 2018 just 40 seconds into the match getting on the end of a ball fed in by John Palma. The Vikings scored 8 more times in the first half to take a 9-1 lead into half time. Lanier kept a clean sheet in the 2nd half while adding two more goals to come away with a lopsided 11-1 victory at full-time. Shelove Dorsainvil came off the bench to score a first half hat-trick in 15 minutes. Edgar Mejia scored two and picked up three assists. Manny Reyes and Rodrigo Suarez both impressed on their Varsity debuts contributing an assist and a goal respectively. At the other end of the pitch, Michael Varela anchored the back line with Agustin Ugarte and Chris Torres in front of confident Goalkeepers Jorge Nava and Edwin Arteaga.